Is it OK to hang a mirror opposite the main door? No, it is not. Hanging a mirror that reflects your main door will cause any luck that enters your house to rush straight out again. This will cause many opportunities to pass you by, and the wealth of the family will be difficult to sustain. Remove your mirror immediately! QWhen is the best time of the month to move to a new house? My folks usually followed the phases of the moon. I forgot whether it’s the new moon or full moon that they followed. Would the dates and days also be relevant? Say, moving on the 8th, which is a Sunday. Please enlighten me. When picking a date to move house, or indeed when picking a date to do anything of significance such as signing an important agreement, getting married, etc, what is most important is that the date you pick does not CLASH with your animal sign. If you use the WOFS Feng Shui Almanac , you can also zero down to days that are particularly auspicious for particular activities. As for following the phases of the moon, in general, it is believed that the waxing cycle of the moon is much more auspicious than the waning cycle of the moon. Full moon and new moon days are also considered lucky days, but only if you are strong enough to take them. As for picking days using the method involving days of the week – e.g. Monday, Tuesday, Wednesday, etc – this depends on your animal sign. You can find more on this method in Lillian Too’s new book “Eight Characters – Chinese Personal Forecasting .” You can also read a preview on this method of selecting days in her Fine Points Of Feng Shui column this month on page 20. QI’ve heard that couples should not present knives as gifts to each other and also not to have a mirror facing the bed. My girlfriend intends to buy me shoes and someone told me that this is taboo as well. Is this true? What other gifts should couples not give to one another? Definitely knives make very inauspicious gifts, especially between couples, as it symbolizes a “cutting” of the relationship. If you give a knife to a loved one, it is essential the recipient pay a token sum like one ringgit to the giver, so they symbolically “buy” the knife rather than receive it as a gift. Other sharp objects such as scissors are also not recommended. Watches and clocks symbolize time running out, so again, the person receiving the gift should pay a token sum to the giver. As for shoes, these make quite good gifts especially when parents or someone older gives them to a child. It symbolizes wishing them a good and independent journey through life. But between couples, if you think it’s more like “kicking you in the face”, then you can get round that by avoiding such a gift, or again, by the recipient paying a token sum to the giver. Indeed, one should be a little wary about buying shoes as gifts for adults, for one’s superiors or for loved ones. For one’s employees or for children, shoes as gifts signify good meanings. QWe have a large patio and deck behind our house. I am trying to make them more inviting by adding plants, lights, nice furniture etc. I would love to add a fountain or other water feature but was told that it was very bad feng shui to have a water feature behind your home. Is this true? If so, do you have any other ideas? I would love to be able to sit outside to the sound of running water. Thanks so much! Under the landscape school of feng shui, water is best when in front flowing gently towards the home, while the back of the home benefits from a small hillock to give support. However, water features behind the home are not necessarily unlucky. 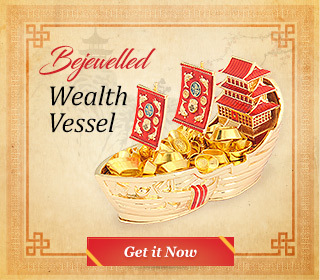 In fact, if your water star 8 is located at the back of your home and you have water there, it can bring you much wealth! It is “holes” in the ground located behind the home that you need to be careful about. The Chinese often refer to “water” as a large expanse of water, and the instability of water comes when there is too much of it, and it is dug into the ground, like a swimming pool. The type of water feature you mention is perfectly safe. Just make sure the water in your water feature appears to be flowing towards your house, and not away from it, or it could end up draining you of your wealth! QNeed your advice; are there any fake Dzi in the market? I saw many shops selling Dzi. I just bought a nine-eyed Dzi and I worry I bought a fake one. Why are some Dzi so expensive? Always thought they were all the same. ADzi beads were once only known about in Tibet, the “Land of the Snows”. Today, a genuine antique Dzi bead from Tibet is so rare and thus so expensive, that it is quite beyond the reach of many people. And these are probably the expensive Dzi you are referring to. However, the power of the Dzi lies in the different patterns on the beads. You can obtain an affordable Dzi today, but when buying your Dzi, just make sure it is made of agate chalcedony, and not plastic, as the plastic ones have no power. Nor should they be made of bone, plaster or metal. They should be of natural “stone”. You don’t need to wear an antique Dzi for it to bring you auspicious luck. Different designs on the Dzi bring different kinds of luck, so pick one you feel you have affinity with and one suited to the kind of luck and energy you want it to bring for you. Or if you wish, you can check your animal sign and wear those that are suited for you. QI helped a new manager to settle down in the company. In return, I was praised by the management team. Later I was assigned to help another team. But when I returned to my team, my junior was promoted. I have checked, my manager is born in the year of the Ox, while I am born in the year of the Sheep. I feel I am not treated well. Please help me. AIt is likely that your colleague who got promoted succeeded in catching the eye of senior management and impressing them sufficiently to become promoted. Rejoice in his success and then focus on your situation. Activate your career direction by bringing some water energy into the North of your office. Be patient – do not harbour ill feelings because someone else lucked out before you. It could well turn out to be a blessing in disguise. QI need to know whom I’m supposed to be with. My husband and I have been together for almost 4 years, married 7 months. I can’t stand him. I don’t like him. I’m not attracted to him. I can’t even stand the thought of being intimate. We have a 3-year-old son together. The reasons for us being together are not the best, and I’m not happy. He of course is as happy as can be and can’t understand what my problem is… I cheat all the time and don’t feel that bad about it. I have even tried to get him to cheat so that I can divorce him. Am I really supposed to be with him? I am tired of this immature behaviour of mine and would like some guidance. My gosh, this is serious, very serious, and if I may say so you are behaving like a fool! If things are so bad between you why did you marry him? In any case, you did marry him, you have a lovely son and therefore YOU have a responsibility. If you tried thinking less about your needs and more about theirs, it would help you overcome your present feelings of harmful self-pity. When and if you lose him – then you will realise what you have lost. Just think of what life would be like if he were out of your life now. Listen, my dear, we all go through periods like this in our marriage and it is vital that we do all we can to overcome such negative feelings, which if taken to extreme, will only cause heartache and tragedy. Pull yourself together. Use feng shui to help you by tapping into your nien yen direction when you sleep and eat, and place birds in pairs in the home. Place six round crystals in your living or dining room. Most effective is to direct your feelings, thoughts and actions to enjoying and bringing up your son. You don’t know how lucky you are! QCan I place a Kuan Kung in my Godfather’s bedroom, as it is in the Southwest and needs enhancement? Also, is it OK to place a horse with one slightly cracked leg (chipped off a small portion) in the South section of the house? AKuan Kungs and other deity-type figures are best placed facing the front door. They can also be placed in the living room and in public areas of the house, but some consider it disrespectful to display them in the bedroom. If you want to place Kuan Kung in the Southwest, then do it in the SW corner of the living room rather than in the bedroom. As for your chipped horse, it is better not to display anything that is broken. If you are using a cracked horse to enhance for fame and opportunity luck, that is exactly the kind of luck you will get – luck that is chipped and broken! Go buy yourself a nice, new majestic looking horse for the South part of your house!